Workshops are an amazing and frustrating experience. They’re a phenomenal way to learn new tips and tricks, but at the same time, there are some yoga skills that you simply cannot ever ever ever learn overnight. Yoga forces us to be patient and persistent. You might be able to conceptually understand how to do an asana, but your body will demand you work to obtain the strength and flexibility to get there. Time is our friend when it comes to learning yoga. We can look back and see great growth, even if it doesn’t feel like it while we’re marching on. District Yoga recently held an incredible inversions workshop by internationally renowned Marie Belle. Not only is she a phenomenal yogini and teacher, but she has the most intelligent and beautiful approach to life. Over 100 people crammed into the studio to learn from her, and she still made it feel like a group of friends just hanging out to do some intense yoga. I’m personally tremendously inspired when someone has a rare combination of extreme talent a gracious, non-self deprecating humility. Marie was the very embodiment of this. She also often expressed the idea that yoga mirrors our strengths and weakness of daily life. To me, this is one of the most powerful aspects of yoga. What I learn on the mat carries over into my every day living, and it teaches me so much. How you show up on the mat is often how you show up on life. Bone stacking! 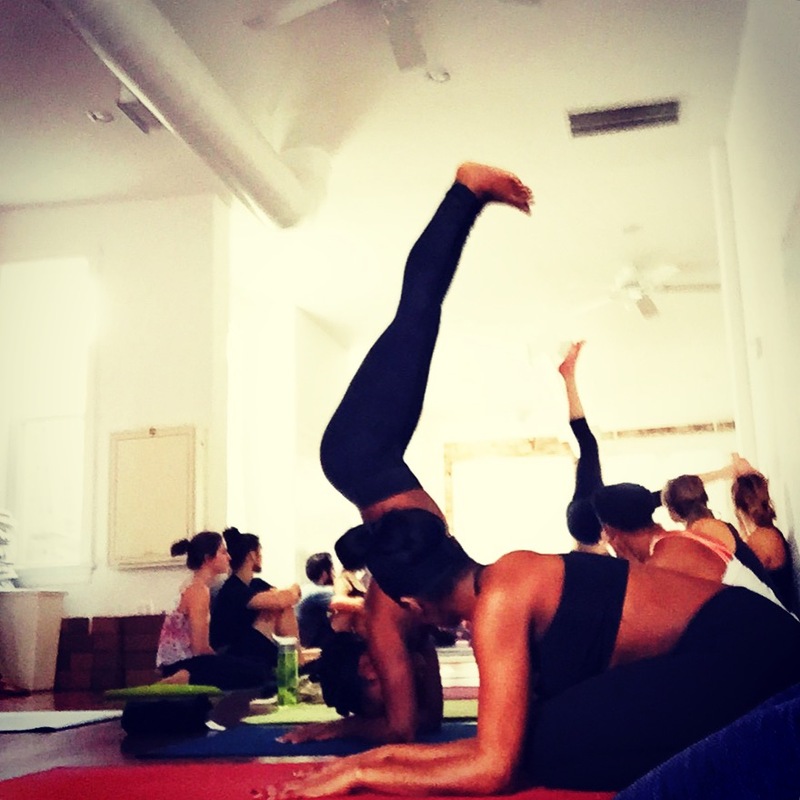 Alignment is key when it comes to inversions. Stack shoulders over hips, hips over hands. Turn thighs inward towards each other when you’re in the air, instead of flailing out. Keep legs and core activated the entire time. To build up strength, practice going from downward dog to an L against a wall. Raise one leg into the air, and alternate.